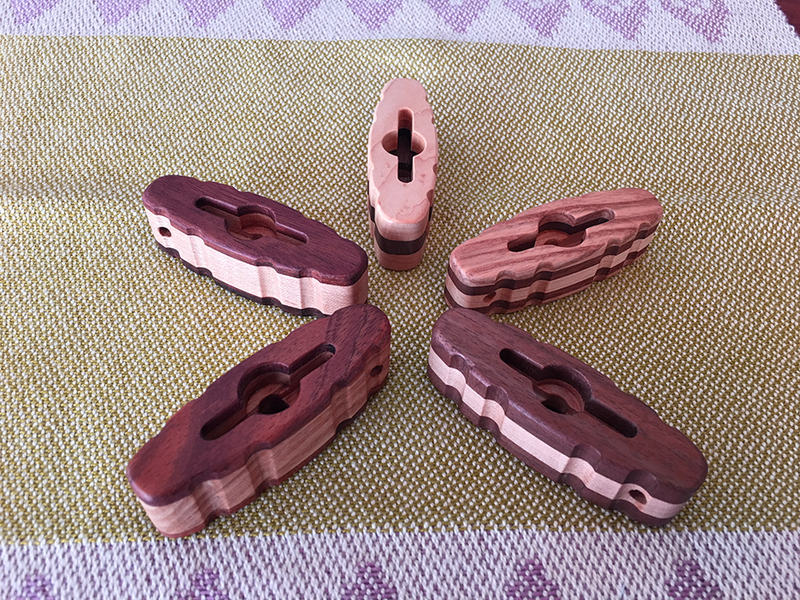 Hand-made wing nut tools are available which minimize wear and tear on weaver’s fingers, and marring of wing nuts and wood surfaces that can occur when pliers are used. The tool gives weavers the leverage needed to avoid hand-strain or the use of pliers to remove or tighten wing nuts (i.e., for changing out reeds in the beater or take-down / setup of some loom models). The tool simply fits over the top of the wing nut and protruding bolt, and you can easily loosen or tighten the nut. They have been well received at our local Weaver’s Guild. The tool includes fluting around the edges for better grip and multiple coats of finish. 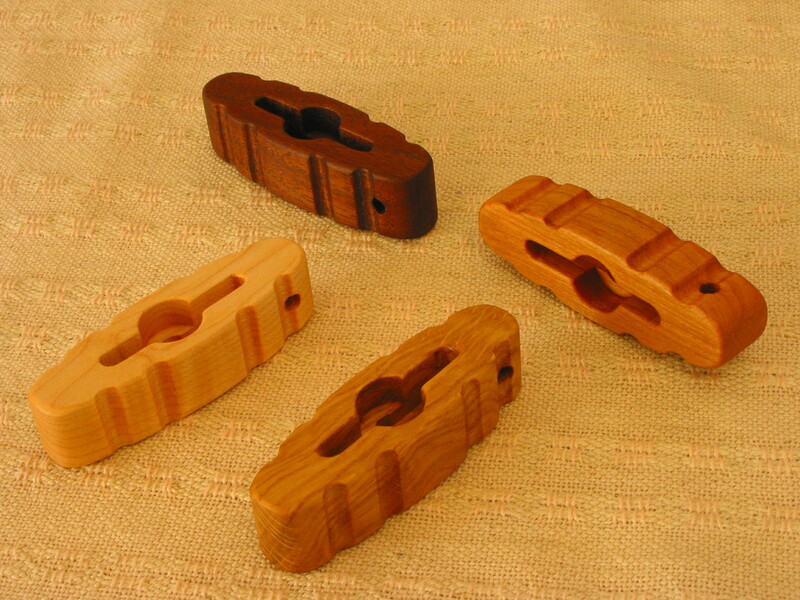 The tool is available in a number of different hardwoods including maple, cherry, walnut, and curly white oak. Email us for wood species that are currently available. If you intend to use the tool on a Kessenich rug loom, let us know – the wing nuts are much larger and the tool requires larger openings. The tool will handle the majority of wing nut sizes found on weaving equipment (wing nut spans of 1″ and greater). If you have wing nut with spans 3/4″ or less, we can make a version of the tool with sized-down openings. Dimensions of tool: 3” L, 1” W, 3/4” to 7/8” H, and slot to fit wing-nut is 1 1/2” L.
Note : These wing nut tools can apply a very large amount of torque on wing nuts, so be careful not to over-tighten wing nuts with them on your equipment – you want to avoid leaving washer imprints on your finished wood. 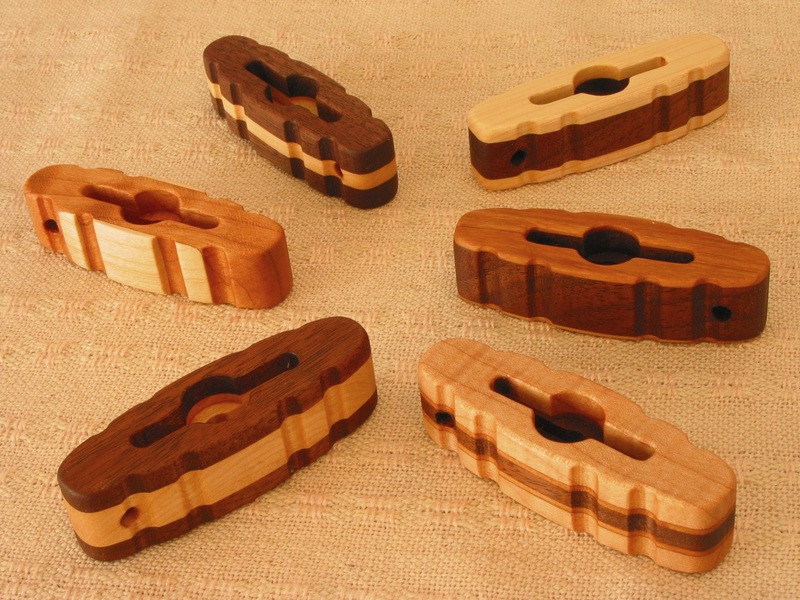 Exotic wood or Layered tools: $16 each plus shipping – email us for availability since we don’t always have these on hand. Note: as of 2/8/2019, layered tools are sold out, but will be replenished summer of 2019. 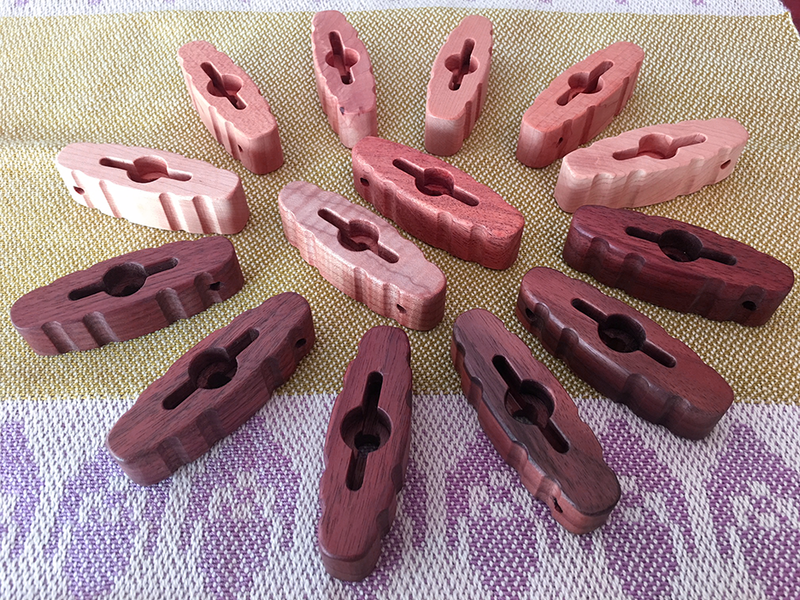 I have hand-made wing nut tools available that minimize wear and tear on weaver’s fingers, and marring of wing nuts and wood surfaces that can occur when pliers are used. The tool gives weavers the leverage needed to avoid hand-strain or the use of pliers to remove or tighten wing nuts (i.e., for changing out reeds in the beater or take-down / setup of some loom models). The tool simply fits over the top of the wing nut and protruding bolt, and you can easily loosen or tighten the nut. They have been popular with many weavers. The tool includes fluting around the edges for better grip and multiple coats of finish. The tool is $14 (plus shipping) in any of the four hardwoods shown in the top photo – black walnut (all dark color), maple (all light color), and mesquite (in the middle, upper right). $16 (plus shipping) in any of the four hardwoods shown in the bottom photo row -koa tops/bottoms (2 to left), hard maple (top), black walnut (lower right), and ash (upper right). Copyright © 2019 Canopus Wood and Weave Works.